May I know the link of the form do you want to adjust the text field height? If possible please provide a screenshot of that field. We'll be waiting for your reply to address this concern as soon as possible. Thank you. in fact it now looks OK as I have managed to reduce the font size, but is this the only way? Also, how do I increase the gap between the label text and the field itself? We are very sorry if this might be a too late response for this thread, nonetheless, to resolve this issue, I have injected code in your form to re-align the text and check box relative to each other. 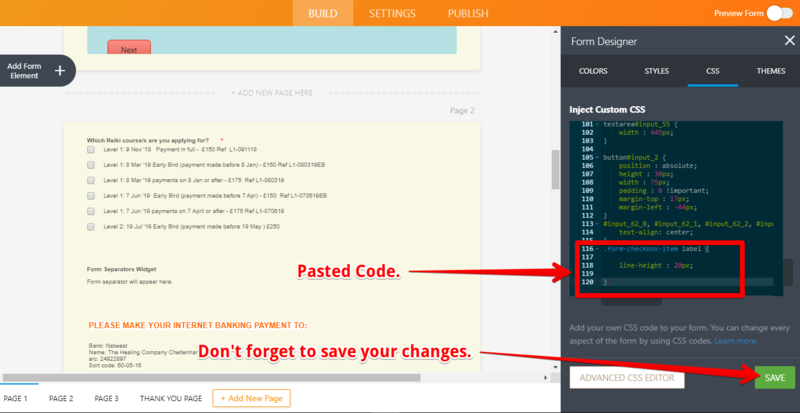 To inject codes, please read our user guide on How to Inject Custom CSS Codes. If you need further assistance, please let us know, we'll be glad to help. Thank you!